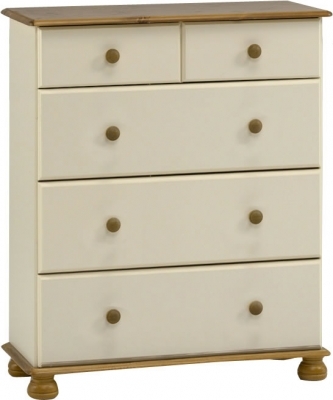 The Steens Richmond cream and pine 2 plus 3 drawer deep chest of drawers features two single top drawers and three large full width deep drawers. The five drawer fronts and units sides are made from MDF in a cream finish. The unit top, base, drawer sides, handles and feet are all made from solid pine in a traditional finish. Free UK Mainland Delivery Estimated 1 to 3 Working Days.